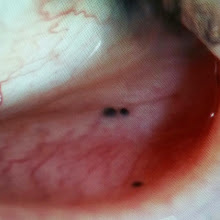 55 year old with POAG presents with this dark/black pigment in the inferior fornix. What do you think this is? Adrenochrome deposits from the use of epinephrine drops. This patient was allergic to all glaucoma drops and opted to use Epinephrine topical drops. She developed these deposits 2 years into the treatment. She underwent canaloplasty surgery during the 3rd year of her treatment and 4 years after discontinuation, she continues to have these deposits! Adrenochrome deposits are from oxidized metabolites in the conjunctiva, cornea and lacrimal systems and stain soft contact lens. Epinephrine is a non selective adrenergic agonist that lowers IOP by increasing both conventional and eve scleral pathways. Most develop allergies/extraocular reactions like headaches, increased blood pressure, tachycardia,arrhythmia. Ocular side effects include pupillary dilation (CI in patients with narrow/occluable angles) allergic blepheroconjunctivitis and CME (in aphakic pts).